We had a super early Father's Day celebration. 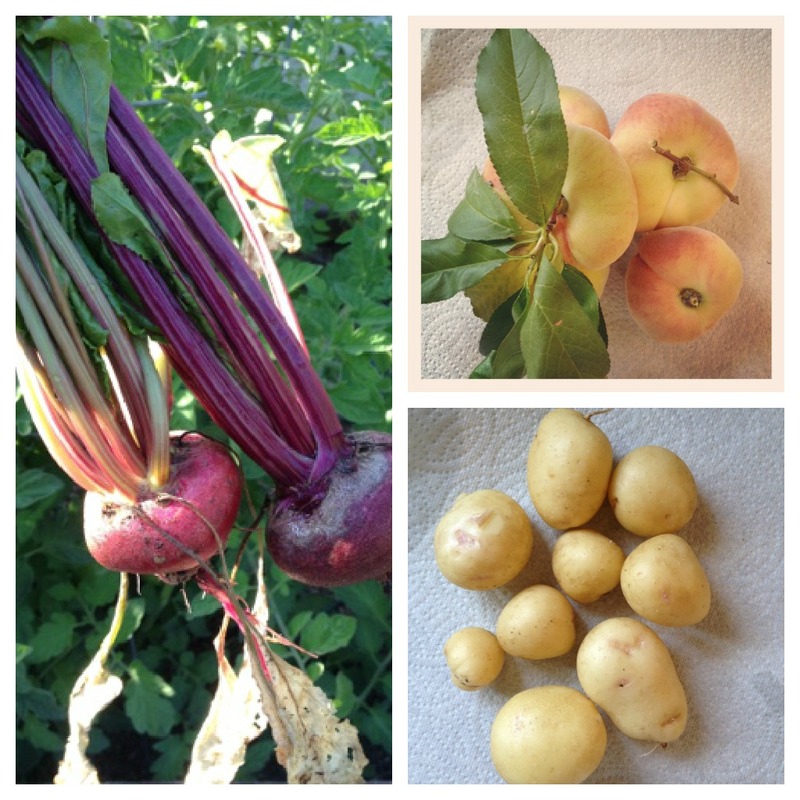 I harvested the only two beets from the garden. We have a rabbit in the backyard and we can't seem to get rid if it. It has eaten so many little seedlings. The radishes are gone! Any ideas how to get rid of him? We have a humane trap set but he is just too smart. Here is our sad harvest of 6 peaches (we already ate one) and 9 potatoes. I need a gardening fairy to come and analyze what we are doing wrong. Last year we had so many peaches,the birds were eating them faster than we could pick them. Potatoes....HELP! 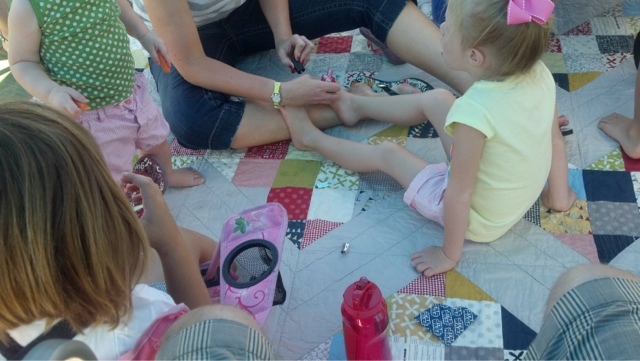 Our son sent us this photo of the Patchwork Chevron quilt being enjoyed by many. 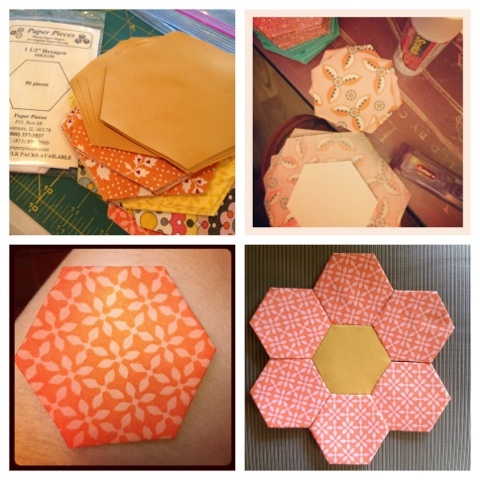 I joined Katy's QAL to make her gorgeous Hexy MF quilt. This will be the perfect travel project for me. You should join us, "Go on, I know you want to",as Katy would say. I was originally going to make it a "Texty Hexie" and use all text fabrics, but in the end scrappy sounded better. I hope mine turns out half as gorgeous as Katy's. Here's the Touch Draw mock up, courtesy of Lynne. I bought two packs of the paper pieces from my LQS and ordered the big pack from the online source Katy suggested. With the online prices and Katy's discount code they were nearly 1/2 the price I paid at the LQS. I love online shops! 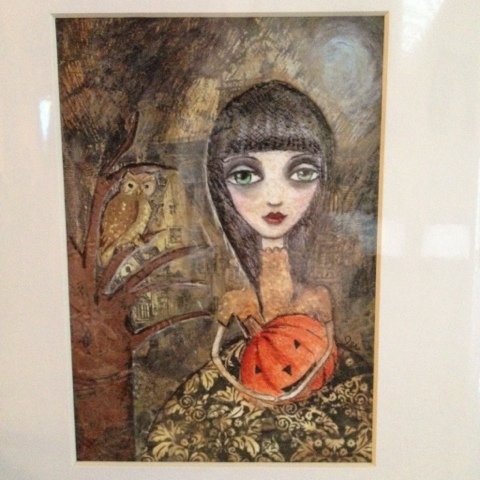 I won this (sorry for the reflective photo) original artwork from my sister's blog giveaway. Yes, I won fair and square according to Mr. Random Number Generator. I just love this Gothic Girl. You should check out some of Geri's other artwork here. Let the rabbit have the veg this year. Because you are too busy enjoying your holiday over here to eat them yourself! You family of fellas is so handsome! Last year we managed 2 apples, a pear and a dozen damsons, so you beat me already! I planted yesterday and already one plant is nearly eaten to the soil! Darn squirrels/rabbits! Oh well. I guess you could leave rabbit food in a dish and maybe they would eat that instead (fat chance!) You'd probably have the whole neighborhood of rabbits at your house. Hi Kiddo! don't know bout the taters...we haven't had much luck with those..ever! LOL We do a big garden too. BUT....we have close to 280 Peach trees! We have tons of peaches bout every other year. Seems to be their "Rule".... last year we didn't get enough to make more than 3 cobblers..from all those trees. Should do great this year! Tada! Wow - you should be a food photographer as your photos are amazing. 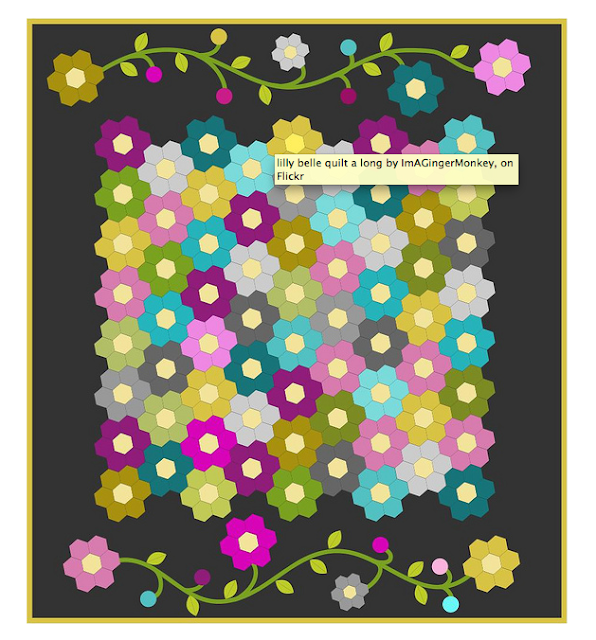 I would love to do the Hexie MF quilt but will I get my templates in time? ?